This book is part of Pam Allyn's highly popular Core Ready program, a dynamic series of books that gives educators critical tools for navigating the Common Core Standards effectively, fluidly, and successfully. Using the information presented in the series, educators see how to take complex concepts related to the standards and turn them into practical, specific, everyday lessons. The books address the needs of all learners, including ELL and special needs diverse learners, and cover the uses of technology and new media. Grade K-I Have a Voice: What Is an Opinion? The grade K lessons lay the foundation for understanding opinions. The grade 1 lessons build on this understanding and introduce the concept of using evidence and reason to support an opinion. And the grade 2 lessons put the skills to work in a rigorous but exciting and fun set of lessons with real-world implications that bring the ideas to life. Additional attention is devoted to developing effective listening, conversation, and speaking behaviors when discussing, collaborating, or debating with peers. Recognize and develop opinion and argument through reading, writing, listening, and speaking. Foster an awareness of purpose and point of view by examining the views of others and developing individual ideas and voice. Consider their own passions, viewpoints, and reasoning by exploring opinion in real life, literature, and a variety of persuasive genres. Practice effective listening, conversation, and oral speaking behaviors. 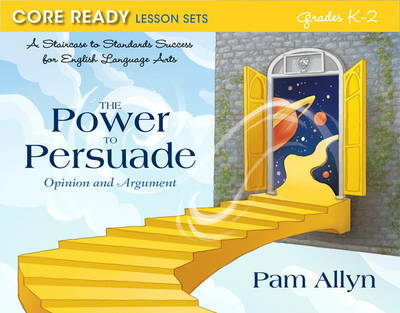 Visit http://pdtoolkit.pearson.com to purchase access to the PDToolkit for Pam Allyn's Core Ready Series. The PDToolkit access does not come with the print book. PDToolkit for Pam Allyn's Core Ready Series is a supplemental online subscription-based resource that provides the tools that educators need to implement the Common Core Standards effectively, fluidly, and successfully. The PDToolkit, together with the texts, provides the tools you need to ensure a standards-aligned year of joyful, effective, research-based literacy curriculum. "[T]his is a great way to teach ELA.... a group of teachers could use this to change their core reading program... I see this as a way to truly become a reader and writer for today's world." "This book is so inspiring! I hope many districts adopt your program! It will change the lives of many students for the better!" "Pam Allyn's impressive book, Be Core Ready, provides practical, useful, and insightful advice on how to implement the Common Core State Standards. Her conversational tone, passion for literacy, and, above all else, her unwavering commitment to doing what is best for all learners will help educators build core strengths in every student. Multiple copies belong in every school's professional development collection." "In this informative yet accessible book, Pam Allyn draws upon her extensive understanding of the Common Core State Standards and the changes they demand for literacy education to offer innovative strategies and implementation techniques that develop college and career readiness and inspire all students to become 'curators of ideas' and lifelong readers, writers, speakers, and listeners. I will definitely use the Core Ready Series in my ongoing work with teachers and city schools." "An inspiring book; filled with thought-provoking insights into the Common Core standards. Pam alleviates "core anxiety " by providing innovative ways to fill any gaps that may exist in your current classroom practices. She takes a look at the everyday literacy skills utilized by a variety of professionals and weaves a link down to our youngest learners. Pam's explanations of the necessary "shifts" I need to make in my teaching are user- friendly and easy to implement. I love the Colleague Conversation starters designed to open dialogue, share ideas and reflect on personal literacy experiences. I can't wait to share this uplifting resource with all of my teacher friends!" "Let Pam Allyn help you conquer the Common Core by going to the core --the core of what readers do when truly engaged with books." "Help is here. As educators scramble to prepare themselves for the common core standards, Pam Allyn has produced what many will find to be an invaluable resource. Written in a clear, compelling and accessible manner, Allyn brings years of research on literacy and teaching to help educators respond to the higher standards created by the Common Core. By following the advice she offers and creatively applying the ideas presented, educators will find that we not only have no need to fear the Common Core but we can embrace it as a way to address the learning needs of our students."